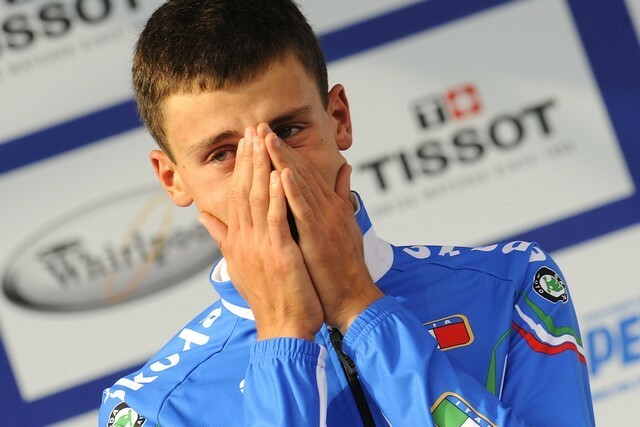 Italy started the world road race championships on home turf with a world title on Tuesday, with Adriano Malori taking the men?s under 23 time trial by a huge margin. Malori is only 20 but is the current European time trial champion and finished fifth in last year?s world championships. A year older and clearly stronger, he blasted round the tough 33.5km course in the hills north of Varese to win by 49 seconds. Germany?s Patrick Gretsch was second despite crashing in the final kilometres, and Australia?s Cameron Meyer was third after setting the fastest time or most of the day. British riders Russell Hampton and Alex Dowsett both finished outside the top 30. Hampton was 33rd at 2-48, while a very disappointed Dowsett was 36th at 2-59. Both seemed to lack speed on the demanding climbs and Dowsett openly admitted he had a bad day. Malori was clearly the strongest rider in the time trial and used his strength and power to push a huge 55×11 gear on the long descent in the second half of the course. He set the fast time at each of the three splits and had the advantage of starting last in much drier conditions after morning rain. ?I?ve always pushed big gears but it was really important on the descent. I was pushing 55×11 way on the descent and I think it meant I gained a lot of time,? Malori said. ?It?s difficult to understand what happening when you win the world title on home roads. It?s almost difficult to describe how I feel.? ?It was a huge advantage that the roads were drying out when I set off. The fact that the sun came out at two o?clock was a sign that things were going to go my way. Thing have to come together if you want to win.? Malori claimed he did not grow up with a professional rider as a role model but admitted that Lance Armstrong often inspired him. His rainbow jersey will probably secure him a contract with a professional team but he refused to be say what he hoped to achieve as a professional. However he was optimistic for the future of the sport. ?I don?t know what kind of rider I can be in the future and don?t want to try and say because too many riders have lost it after being successful amateurs. I?m focusing on the present at the moment. Obviously I hope cycling will get better in the future. I?m an amateur don?t know what?s it like on the other side but I think things are improving and cycling will be even better in the future.? Australia?s Cameron Meyer spent a long time in the so-called ?hot seat? as he waited for the other riders to try and beat his time of 42-40. He eventually slipped to third but was satisfied to be the first Australian since Michaell Rogers in 2000 to win a medal in this category. ?It?s very hard to get a medal at the world championships. I was excited about racing here, it was very hard circuit and to get on podium made me really happy.? ?I was nervous sitting in first position for so long. I was hoping not to finish fourth because I?ve been fourth in the last two track world championships and at the Olympics.? ?Michael Rogers is a role model for me and I?d love to follow in his foot steps and go on to do well in time trials and major stage races.? 36. Alex Dowsett (Great Britain) at 2mins 59secs. WHERE ARE THE START LISTS?